Because oil crises or other supply constraints distort energy production and demand management, energy pricing remains an important policy instrument of economic management. Moreover, for many developing countries, the problem of energy management includes the pricing of energy products within a framework of planning, as well as questions of supply. In many countries energy production and distribution are now publicly managed. Such public operations have to account for both efficiency in production and equity in distribution. The pricing of energy inputs thus emerges as a key planning parameter. Capacity expansion decisions are critically important to both public and private-sector energy suppliers as well as regional and national energy planning agencies. Simplistically stated, planning for the expansion of an energy supply system involves determining when and where new energy production facilities of various types and sizes should be deployed to meet projected demands. As with most energy-related decision problems, several factors complicate capacity expansion planning. 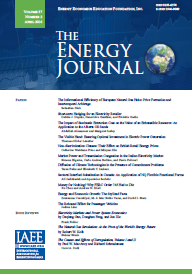 These factors include the involvement of multiple decisionmakers and interest groups, uncertainties about technology costs and demand projections, varying degrees of risk associated with alternative energy technologies, the need to consider costs and effects over long time horizons, and the difficulty of quantifying key impacts and concerns. Since the establishment of a private market for uranium in the United States in the late 1960s, the industry's fluctuating fortunes have been reflected in the short-term price of uranium as represented by NUEXCO's "exchange value."' Exchange values are current prices for current or near-term delivery. While NUEXCO emphasizes that its exchange value is not a "spot" price in the usual sense of the word, it still is generally regarded as an indicator of uranium spot (short-term) market price levels. The years since the 1973 spurt in oil prices have witnessed a growing interest in renewable energy sources. Increased attention has been paid to the development of technologies using new and renewable sources of energy, such as solar, wind, tidal, biomass, and hydropower. These sources are all the more important in developing countries with scarce conventional sources of energy like coal and oil. The new and renewable energy resource systems offer attractive prospects because they are pollution-free, unlimited, and often cheap. They can also help preserve ecosystems and retard degradation of the environment. Moreover, renewable energy resources can be developed extraordinarily rapidly, as shown by the experience with wood fuel in United States, small hydropower and biogas in the PRC, and energy crops in Brazil. In some countries technical advances have brought wind machines, solar cells, and biogas close to commercialization for heating and electricity generation. Thus far, over 3 million solar water heaters have been sold in Japan and over 5 million wood stoves in the United States. Since the Organization of Petroleum Exporting Countries (OPEC) emerged in the early 1970s as a dominating force in the world petroleum market, much effort has been devoted to investigating the relationship between U.S. demand for crude oil imports, the world price of crude oil, and the domestic price of crude oil.' Little attention has been paid, however, to the role of refined product imports in the U.S. market. My purpose is to fill this gap through an empirical investigation of the "competitiveness" of refined product imports in the domestic market. The focus will be on the motor gasoline, residual fuel oil, middle distillates, and jet fuel markets, as these four products account for most domestic product consumption. Competition and regulation are often perceived to be in conflict, because regulation usually evolves in response to a failure of the market system. In the case of public utilities in the United States, the familiar argument is that production scale economies make it cheaper for a single firm to provide essential products or services than for two or more firms to do so. To take advantage of the production efficiencies but avoid the resource allocation problems inherent in monopoly levels of price and output, either assets are publicly owned or a privately owned firm is regulated.' In the first case, the incentive to maximize profits is replaced by the need to maximize political support.' Thus the price charged for output is less than the monopoly price. In the second case, states have created public utility commissions (PUCs) to control both access to the market and the monopolist's price and output decisions. The sharp oil price increases of the 1970s, and the consequent balance-of-payments difficulties, encouraged many oil-importing developing countries to develop and exploit their indigenous energy resources. Today, several developing countries with commercially attractive reserves of natural gas (for example, Bangladesh, Egypt, Pakistan, and Thailand) have seriously begun to use their gas resources for internal domestic and industrial purposes as well as for exports. They now confront the basic economic question of how to value gas resources and how to allocate them. The initial stimulus for this note came from Chung and Aigner (1981), which examined the impact of a major change in electricity tariff structure on industrial and commercial electricity demands. Using a translog cost function the authors investigate the effects on consumption of a change in the pricing practices of the Pacific Gas and Electricity Corporation (PGEC). Instead of charging a uniform price for electricity throughout the 24-hour period, PGEC switched to a "time of use" (TOU) pricing regime. The model performed well for 10 of the 13 industry groups over the 41-month period, and indicated a considerable variation across industries in the impact of TOU pricing. The authors find a general pattern of moderate response to TOU pricing in the peak period and some substitution among electricity demands over other times of the day. The industries that showed the most elastic demands were logging camps, paper mills, industrial gases, and cement manufacturers (as well as shopping centers and educational institutions in the nonmanufacturing sector). The limited available evidence suggests that a similar diversity of responses exists across industries in other countries (Mitchell, Manning, and Acton 1978, pp. 89-120). In his recent Energy Journal article, G. H. Tzeng emphasizes on the transportation aspects of increased coal use in Taiwan. He does not, however, offer much detail on the economic basis for the switch in National Energy Policy from imported oil to coal. While such a switch confirms that the exercise of rational fuel mix choices has found its due place in Taiwan, it seems appropriate to examine the efficiency of such a switch and its implications, especially for import balances. The new Taiwan energy policy Tzeng describes would increase coal consumption from 7.8 million tons (MT) in 1982 to 43.4 MT over the period ending in 2001. Ninety percent of this requirement would be imported. Of this, more than half would go to the electric power industry (23.8 MT by 2001). The total growth in coal consumption projected by Tzeng for this period amounts to 456 percent in 19 years. This paper analyzes the causes of the recent stagnation of Hungary's gross energy consumption. Applying a dynamic method, we estimate the effect of three factors: reduced growth, structural adjustment, and energy conservation. After an explanation of the methodology and a description of the estimating procedures, we discuss our results and offer some conclusions. Individual equations are contained in the appendix. One of the greatest compliments that can be paid to a research effort is an attempt to refute its findings that instead replicates those findings. That is the present case. Commenting on Carpenter and Chester (1984), Peterson (1985) states, "The authors conclude that conservation credits have done little to stimulate conservation expenditures, but that the renewable energy credit has increased the demand for solar space and water heating systems. Unfortunately, problems with the data used by Carpenter and Chester cast doubt on their findings." Peterson then concludes, from his analysis of the "better" data set, "The percentages from the table suggest that solar purchasers are much more affected by the availability of tax credits than are conservation investors." In the late 1970s concern about energy shortages motivated Congress to establish federal income tax credits to individuals for (1) household energy conservation expenditures and (2) purchases of renewable energy systems. Under terms of the Energy Tax Act of 1978, the tax credit for conservation expenditures is 15 percent of the amount invested, with a maximum credit of $300. The credit for renewable energy systems (such as solar space or water heaters) was initially set at 30 percent of the first $2000 and 20 percent of the next $8000. In 1980, the Windfall Profit Tax Act increased the tax credit for renewable energy systems to 40 percent of the first $10,000 in qualifying expenditures-a maximum credit of $4000. In recent years, the greenhouse problem has aroused widespread public concern. Changing Climate, a report by the National Academy of Sciences (NAS) (1983), represents a useful and timely synthesis of current scientific investigations of the impact of greenhouse gases on climate and society. The report is notable both for the research it documents and its influence on the public awareness of the issue.